Darlings, if you would so kindly allow your pretty peepers to rove to the left, you will spot Paige Denim’s très chic Corduroy Verdugo Jeggings; now take a gander to the right and you will see GAP’s glorious Always Skinny Cords. While the ambrosial Always Skinny Cords lack the tonal stitching upon the back pockets a la the Paige Denim darlings; for just $59.50, in comparison to the $148.00 price tag of the Corduroy Verdugo Jeggings, they are every bit as ideal for welcoming the cool fall weather – at a price that allows one to splurge on all four colors (flint gray, true indigo, black, and tomato)! wow. interesting results..and I am so crazy about those shoes in the Gap pic..which I guess doesn't come with them. Great find. Another great find girl! I would definitely take the Gap jeans this time. A real must for fall. Cool at the Gap. Here's the thing: my bum looks fantastic in Paige jeans so I actually, for the first time, splurge at Cafe Fashionista. I love saving money but I love my bum even more. Gap for sure. I need some jeggings! The GAP ones look fantastic! J Crew also has some on sale right now. I got a pair last year and love them!!! LOVE the Gap ones! I've been looking for a cute pair of gray jeans; these are fab. Gotta go to the GAP. I love the GAP ones! Definitely have to save on this one! Gap is rocking the jeggings, right? They are awesome. Now, about that new logo... not cool. Both look amazing, but I really like the Gap ones. I just need an excuse to buy something from GAP. I don't know if the jeggings would be it, though. If I had to, I would definitely bee a tightwad. Hope you're having a good day. Oooh, I can't wait to wear my cords this fall! Hmm, the problem here is that I really loved my last pair of Paige Jeans and I've never had very good luck with Gap's jeans. So, today, I'm gonna say splurge! I actually really love the Gap pair. They look fantastic! So gonna go for the GAP ones here! GAP it is! The girl is tight on cash. Thanks for sharing dear. Loving the gap jeans! They look amazing! I actually like the GAP one better. I meat, aside from the obvious YAY SAVE MONEY aspect, I like the wash far more! They're both very cute. I'm picking the GAP one: GAP stuff always fits so well. i love those jeans ! But I would prefer the one from Paige - mostly because i've only had bad experiences with GAP! I actually like the Gap ones better. I hope this finds you doing well. Have a great week. I like the Paige denims the most. Ohhh I want the Gap ones! Great alternative. I actually like the color of the Gap cords so much better. I might have to go pick up a pair. My closet is lacking some skinny cords and these are perfect! Thanks, Erika! Cords are my favorite go to pant in the summer! J Crew has fabulous options as well! I like the color and I like the gap ones! 1. 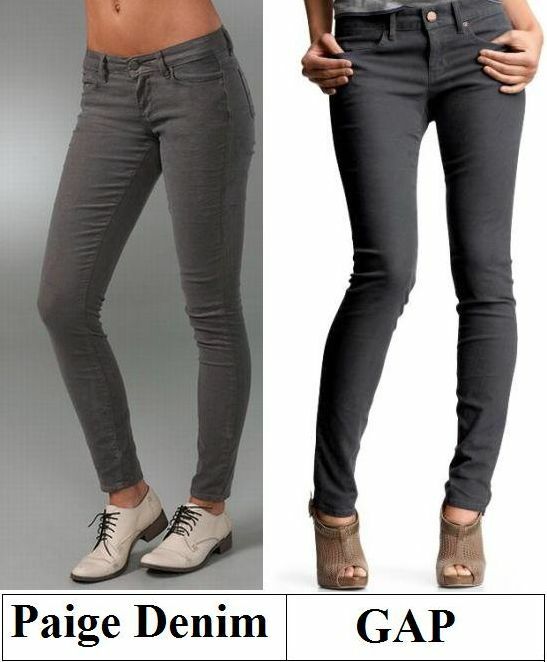 I love Paige denim, and I love this style!! GREAT BLOG!! loving those jeans ... you have some great givaways goin on girl! You're awesome!! I love both, but would definitely go for the GAP ones! Very cute, and I need new pants!